Not obsess about what to eat? And when to eat? 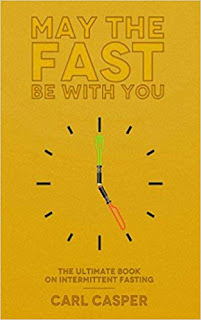 May The Fast Be With You: The ultimate book on Intermittent Fasting is a step-by-step blueprint to a healthier way of eating without letting the tracking of those meals take over your life. The author Carl, with over three decades of experience in the health and fitness industry, guides you to achieve your desired body by finding the perfect balance between indulgence and healthy meals, by the simple concept of TIME. I have transformed his own life by using these specifically timed fasts and gives you a detailed version of his weight loss diet plan and weight maintenance diet plan. The core ideology of Intermittent Fasting is at the heart of many different diets like 'The IF Diet', 'The 8 hour diet', 'Warriors Diet' '5: 2 Diet' and many more. Understand the fundamentals and you're ready to tackle them all. The book even helps you explore the sweet spots between Intermittent Fasting and Ketogenic diets. This book on Intermittent Fasting is for beginners and veterans alike. Utilizing the basic principles of how human beings were programmed to eat, Carl imparts advice on how to deal with unnatural hunger pangs that are created in the brain rather than your stomach. This is not one of those 'How to lose weight' or 'How to get fit fast' charades, although that might be a consequence, it is not your quintessential weight loss, it is more with regard to the Intermittent Fasting lifestyle. This is an all-in-one of fasting books.